Yecla is one of the smallest DO’s in Spain. Most people have never heard of it. For this reason it makes my Wine-Phabet, I always root for the under dog. Talking about roots, Yecla has deep roots. Although the city of Yecla bares the same name as the region, it was discovered well after wine growing had already been established. Wine growing dates back to the early Romans, some people believe that the Phoenicians brought many vines to the region. Now where are these roots planted? 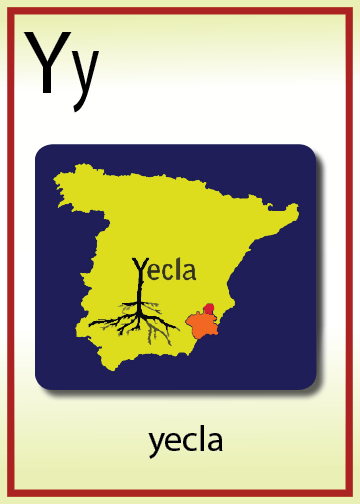 Yecla is located in a region called Murcia. It borders the plateaus of La Mancha, lies southeast of Valencia and north of the coastal city of Alicante. The soil is a limestone base with sandy top soil. Phylloxera infested the area at the end of the 19th century. Luckily, due to the sandy top soils, many roots were spared. To this date many of the wines are on their original root stocks. Have you ever heard of these grapes: Airen, Merseguera, Macabeo, Malvasia, Monastrell, Garnacha Tinta and Garnacha Tintorera? These are what you might you might find growing along with Cabernets Sauvignon, Syrah and Chardonnay. Yecla is most notably known for Monastrell, also known as Mourvedre. The concentrated reds grow best in the Campo Arriba, an area to the north with higher elevation. The whites are mostly grown in the south in the Campo Baja, a flatter region. The wines of Yecla are suitable for the new world palate. They are concentrated and can reach high alcohol levels. Although they posses an earthy character, the fruits are vibrant and can range from dark berries to dried plums. One of the most accessible producers is Bodegas Castano. Their wines can be found at your local World Market or Costco. The wines are well priced and are a bang for your buck. The root of being a good wine drinker is finding the value in wine, both monetarily and of quality. If you have not experienced Yecla, it’s time to do so.